A great twist to a classic cookie, by combining it with the flavours of a classic camping treat. 1. In a bowl mix your dry ingredients together: flour, salt, baking soda, and set aside. In another bowl with an electric mixer, cream butter with brown sugar until fluffy. Add the eggs, and vanilla and mix until combined. 2. Add the flour mixture to the wet mixture and combine on low speed. 3. Once everything is mixed together, roll dough into balls. About the size of little meatballs. 4. Preheat oven to 375 degrees. And place balls of the cookies dough out on a tray. About 1-2 inches apart depending on how big your balls are. 5. Cook for 5 minutes, and remove from oven. 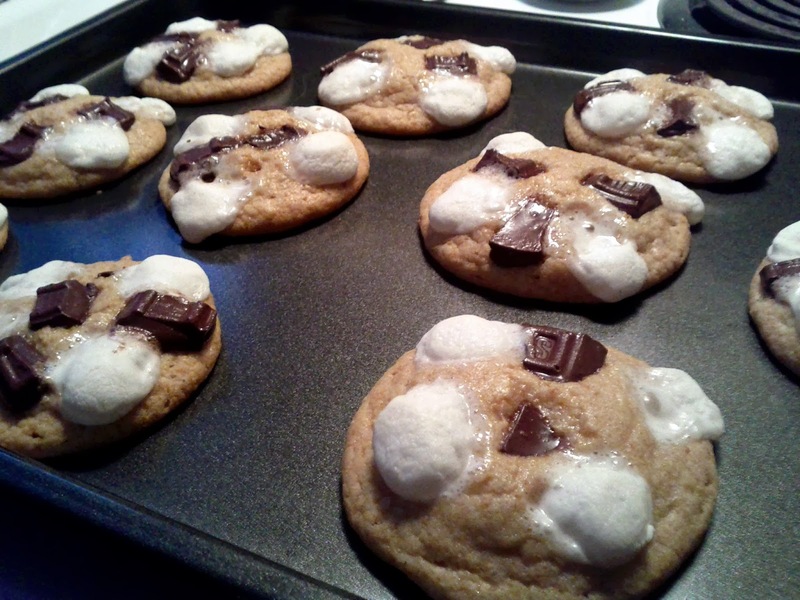 Then press marshmallows and chocolate chunks into the top of the cookies. Then bake for another 5-7 minutes.